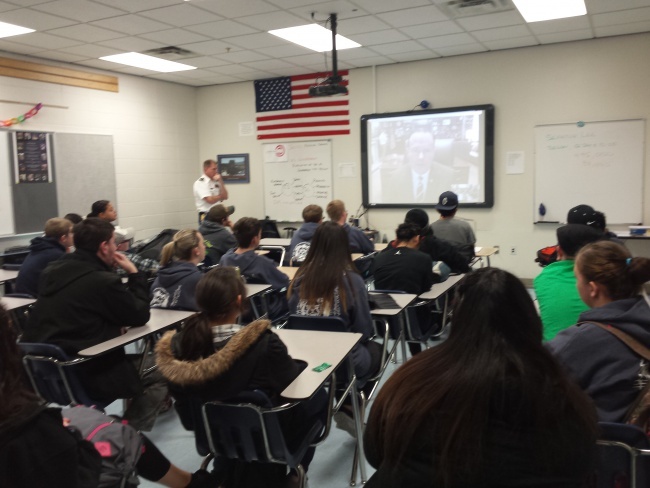 On Tuesday, January 12th, the US Government students at Independence were honored by the unique opportunity to have a face-to-face conversation with Mike Lee, a United States senator from Utah. Senato r Lee, a staunch defender of the Constitution, spoke with the students about the role Congress plays in the federal government. He expressed his concern that the federal government has strayed from Constitutional principles, and in particular the way Congress has delegated the authority given to it in the Constitution to agencies within the Executive Branch. Senator Lee also described the grave danger our rapidly-increasing national debt poses for our nation and its future. At the same time, he expressed hope that a solution can be found if Congress will act soon to remedy the problem. Senator Lee then took questions from the students, which ranged from questions on gun control to the Patriot Act. He gave insightful and thorough answers to as many questions as his time would allow. The students expressed their appreciation for Senator Lee and how impressed they were at his down-to-earth manner and his faithfulness to the Constitution.